Dezeen promotion: modular flooring manufacturer Interface has launched its first collection of luxury vinyl tiles, which can be used to create a mix of hard and soft surfaces in one space. Interface's Level Set range can be used in combination with the brand's modular carpet tiles to create different zones – a technique that is particularly suited to open-plan interiors, in homes, offices and other commercial spaces. The vinyl tiles are designed to resemble both natural and textured materials. They are available in a variety of colours and pattern types including wood and stone. They also come in two different sizes, as square tiles, or as long and narrow planks, meaning they can be arranged in a variety of ways. For instance, they can create herringbone patterns, or replicate natural wooden floorboards. "As the modern workplace continues to transform, flexibility has become a key part of commercial interior design and spaces need to allow for people to grow and create their own meeting places, private corners, and their own rhythms," explained the brand. "The most impactful interior spaces consist of connected, interdependent zones," it continued. 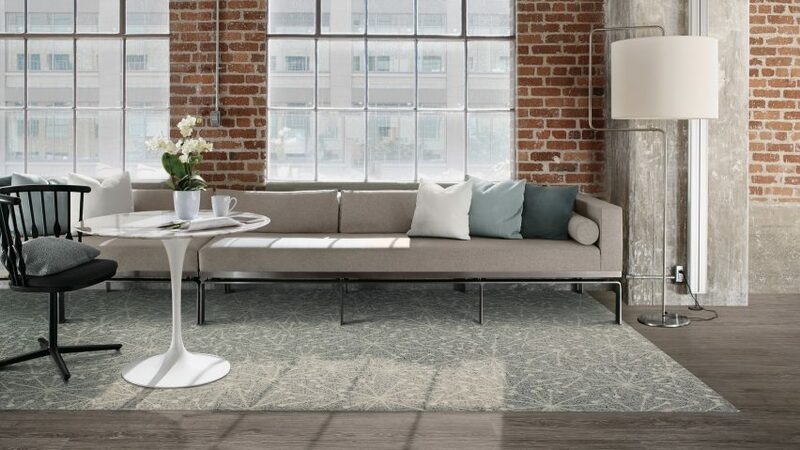 "With Level Set, designers can integrate hard and soft surfaces with a precise fit, combining LVT and carpet tiles side by side,"
Founded in 1973 by Ray Anderson, Interface is the world's largest manufacturer of modular carpets. Past collections by the brand include Human Nature, a range of carpet tiles modelled on forest floors and garden paths.